One day in 1993, while hunting, I saw my first vizsla. I remarked to the owner, Jim Busch, “what a nice looking dog!” Jim invited me to hunt with him and his vizsla, “Buster.” I was impressed with the vizsla’s grace, stamina and love for hunting. I had been looking for a new hunting dog and wanted a family dog as well. I started asking questions; with my son being two years old, my main question was, “How are vizslas with kids?” — and second, having grown up with labs, I wondered — “How much do vizslas shed?” Jim answered all of my questions (see F.A.Q.) and told me he was planning a litter for later that spring. This is when we purchased our first viszla puppy, “Hanna.” Since then, our kids can’t remember a time when there wasn’t at least one vizsla in the house! I had no idea how this vizsla puppy would grow up and change our lives. I guided at a hunt club at that time, utilizing her natural hunting ability with clients, and was often questioned on how and where to get a puppy. At this point the hunt club was growing and one dog was not enough to serve all the clients. I questioned Jim about another puppy and was encouraged to have a litter ourselves. This was something I had never considered, and only felt comfortable doing with guidance. Jim offered to mentor us through the process of our first vizsla puppy litter and we enjoyed it immensely! 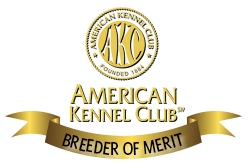 Jim and Linda Busch have now been our mentors and friends for the last 19 years through many litters.